Some of you noticed that I was somewhat AWOL last night and part of today and I want to thank you so much for the concerned emails and phone calls I received. It's nice to know I was missed!! My blog, my email, and my RSS feed all disappeared from the internet and I was told that my 'access was denied'. Denied? What on earth did I do??? After the initial panic subsided, I emailed Google to ask what had happened. This morning I visited their forum and discovered that this was a world-wide issue, but not for everyone. We were told that Google was working on it and by mid-afternoon I was up and running again. Yay!!! I was so afraid my blog was gone forever and, like an idiot, I don't have a paper copy of all my favourite blogs and email addresses...I was panicked, thinking that I had lost all my contacts. Needless to say that particular issue will be taken care of! I'm so glad to be back among the land of the living, and thank you all once again for your concern and cheering up! This is a 28 page booklet of patterns for crochet, tat, and knitted edgings. c 2001 GONE, thank you!! A copy of GreenCraft magazine published by Somerset Studios. Winter 2010 issue. ALSO GONE!! I don't know how many of you remember these little tins! I have had them in my stash for years and never have managed to find an adequate use for them, so they're up for grabs. TINS ARE SPOKEN FOR! and also a pearl necklace with matching earrings. Thank you so much DeeDee - I love it. Debbie Hembree for organizing the swap! Irene (our resident zentangle guru). and mine is on the lower right. of the 'Wild Color' giveaway!! Connie, if you would send me your snail mail addy (marmic1954 at gmail dot com) I will send your book out later this week. Hope you enjoy it!! It's been a good mail week because I've received some pretty nice books. First I will show you this one, which I will be giving away! Specs: 'Wild Color - The Complete Guide to Making and Using Natural Dyes' Revised and Updated Edition. Author is Jenny Dean. LIKE TO WIN THIS BOOK!! I will draw the winner on Feb. 21st. 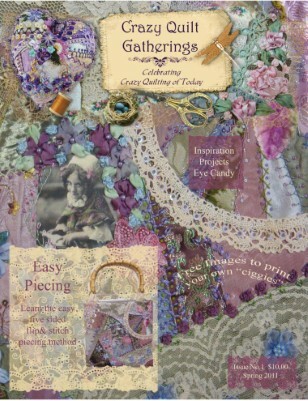 The mail brought my copy of 'Embellishing Crazy Quilts' by Kathy Seaman Shaw (known as Shawkl). Kathy has done an outstanding job on her book. It includes four pages of stitch template patterns, 150 charts of combination stitches in multiple scales; 104 monogram motifs; and over 60 other motif designs. I know this book would be an excellent addition to your library, particularly if you enjoy crazy quilting. If you follow my blog you will already know how much I admire Karen's work, so this book is a little treasure to have in my hands to drool over any time I feel the urge. I'm lucky enough to own a pincushion from Karen too and it's exquisite (and, I might add, it will NEVER be poked with horrible needles!!). I wonder what might come in tomorrow's mail? If you scroll down a couple of entries you will see one of the needlecases opened up. The needlecases, when opened, measure approximately 10 x 8 inches. EDITED TO ADD; Original pattern comes from HERE. Pat Winter has done an outstanding job on this and I'm very excited to have ordered my copy already and it will arrive in the mail shortly. You can also get a digital copy if that's your preference. I see several people are getting both! I prefer a hold-in-my-hand magazine, so I will wait to get it that way. If you want to see more and hopefully place an order, the address is http://www.magcloud.com/browse/Issue/134738 You can see some previews there too. Congratulations Pat on a job well done!!!!!!!! For the knitters in the crowd, you might like to have a look at THIS. Knit Circus is an online (free) magazine for knitters. Today I began working on these needleholders which will ultimately be little surprises for some friends. To continue the denim theme, I stumbled on THIS yesterday and was totally awed by the scenes made from denim. Have a look! Both of these are made of recycled denim. It's hard to see in the photos but each bag has a recycled jean pocket on the sides for extra storage (keys, sunglasses?). The flowers were made of circles of denim that I (at great peril to the house) burned around the edges. Of course the smoke alarms took great exception to that and screamed mightily, scaring the wits out of the cats...oops. I used a commercial pattern by Simplicity (#2597). First of all, I absolutely have to ask you to go and check out Karen's new toe wrap! There are no words in the English language to do it (and her work) adequate justice and you just have to see it to know what I mean. Go HERE to drool! Pat Winter has made some further information available on her blog about the new crazy quilting magazine called Crazy Quilt Gatherings she is producing. It will be available for purchase on March 1st and I can't wait to get my copy! Have a look HERE to read more about it and to see a picture of the front cover. Lots of eye candy! There's no eye candy for me to show you today, although I have spent much of the day at the sewing machine. Hopefully I will finish what I'm working on tomorrow and will be able to show you then. In the meantime, here's another quote... "The question is not what you look at, but what you see." - Thoreau. 1. First of all, happy Chinese New Year to those that are celebrating the year of the rabbit. 2. Carole has posted the registration details on her blog for the on-line fabric journal class. Go HERE for that! 3. Pam Kellogg has posted another in her ongoing series about coping with depression. This time she talks about cabin fever and, as always, she has some very good suggestions (good for anyone who doesn't suffer from depression too). Have a look HERE. From the strength of the title alone I probably wouldn't have picked this book had I not been able to drool over a copy I borrowed from the library. To say I love this book is probably a vast understatement! The author has created modern-day interpretations of the old embroideries and the details are extraordinary. There is a limited amount of actual instruction in this book, but the eye candy alone is worth every penny. I know this book will be read and re-read many times over if only for the inspiration it gives. (Specs: "Celtic, Viking & Anglo-Saxon Eembroidery" by Jan Messent. c 2010. Published by Search Press. ISBN : 978-84448-409-6). (I did crop these pictures but for some reason they didn't save). Anyway, my second choice was this one. With the current interest in bird making I thought this book would be fun and besides, there's a small blurb in there about one of my favourite bird artists (Ann Wood) who makes the most incredible owls. There is an owl pattern in this book and I'm eyeing my denim stash wondering what I can use from there to create one to live in my studio. There are 16 projects in the book (including wrens, a gull, crows, a flamingo and many more). (Specs: "The Artful Bird" by Abigail Patner Glassenberg. c 2010, published by Interweave Press. ISBN: 978-1-59668-238-2). I'm thrilled with the new additions to my library and must extend a huge thank you to my SIS who certainly didn't need to treat me so royally (but, truthfully? I'm so glad she did!!). Carole has two things on her blog that you might want to check out. I mentioned a few days ago that she is planning to run her fabric journal on-line class again. I very highly recommend it because I know you will have fun and create something you will be proud of. Go HERE to read about the class (and to get your name in!). The other thing you will be sure to want to see is her Snippet Roll - complete with a great tutorial. If you are lucky enough to have any wooden spools still lurking in your stash, these would be so much fun to make! Have a look HERE. When Serenity ( a most gorgeous seahorse centaur) arrived she knew precisely what I needed to create for her (and never let it be said that I don't listen to dolls!). She wanted a stand so she could be upright and able to see the world. A search commenced for a large seashell with which to create something suitable. It took weeks of intense searching, but one finally surfaced and she was happy. There was another stumbling block though - how to attach her to the seashell so she would be removable. After a couple of false starts (and a remake) Jack and I figured it out. She now has an (ouch!!) metal rod up her backside and a thinner one mounted into the seashell which end up fitting together. Next she wanted a beautiful necklace to adorn her long lovely neck and you can see it in the photo above. Then she told me she was COLD (here in Canada it's winter and I should have realized). There's even some 'seaweed' in her hair and on her shawl! I think if you embiggen the pictures you should be able to read the text I used. The symbols on the tags are different fonts for the Japanese word 'Serenity'. "Ataraxis' means the absence of stress or anxiety, peace of mind, peace, heartsease, quietude, tranquility - some of which are listed on the back of the tags. She was fun to work on and I hope Amy likes her. Now she's heading off on her further adventures - this time to Calgary! !